I think creating a custom Geom or Stat and its constructor (geom_*() or stat_*()) is enough for the most of the extension packages of ggplot2, but some people, including me, need this. Why are there no geom_highlight()? geom_highlight_point(bar > 20 & baz == "A") is passed bar > 20 & baz == "A" without the data d, with which the expression should be evaluated. It needs d specified in ggplot(...). Anyway, let’s give up here. All I have to do is set this expression as an attribute of a custom Geom and pray that it will be evaluated with the proper data in the phase of building a plot. 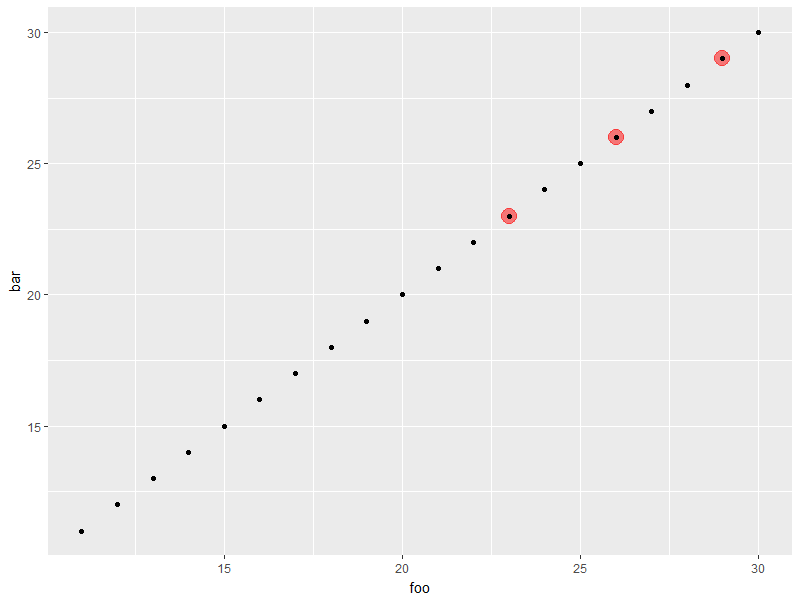 Only + (or +.gg) can access to both ggplot(...) and geom_highlight_point(...). This means that, inside +.gg, bar > 20 & baz == "A" can be evaluated. So…, should I implement my custom +.gg by myself? No, because I will be able to use ggplot_add()! I’m not sure if this is the intended usage of ggplot_add(), but this seems very nice. Looking forward to the next release of ggplot2!